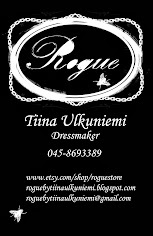 Rogue by Tiina Ulkuniemi: Bag lady is back! Oh this seems to be my 100th blog post. Yay for me! Since I was 3 days at Ateljeekatu last week I had to do something small there since I don't have my own sewing machine there. So lots of new items for sale. Hand bags and pouches. I also made earrings that some of you might have already noticed from my Facebook page. This handbag is made out of recycled fabric. This curtain used to be in Mr Grumpy's kitchen. You can use ether side. I'll be making a second one which is of course slightly different part of the print. I think I'm going to use this new handbag pattern and make Ouija version. I'm also going to use the black and white fabric to make a handbag for sale. Bags Bags Bags...! I still had a small part of the fabric to make another smaller handbag for sale. I know I have said this again but I really love this "alien skin" fabric. Lots of new coin pouches available! I'll list them to Etsy today so that you can get your hands on them in time for Christmas. Price: 18 € + shipping.